dt ogilvie, Distinguished Professor of Urban Entrepreneurship at RIT’s Saunders College of Business, center, was presented with the Trailblazer Award by The Ph.D. Project Management Doctoral Student Association. Joining her are Anastasia Bailey, assistant professor, Rutgers Business School Newark and New Brunswick, Rutgers University, left, and Ozias Moore, assistant professor, Lehigh University College of Business and Economics, Lehigh University, right. dt ogilvie, Distinguished Professor of Urban Entrepreneurship at Rochester Institute of Technology’s Saunders College of Business, has been given the Trailblazer Award by The PhD Project Management Doctoral Student Association. According to The PhD Project, ogilvie was selected for the award based upon her scholarly contribution to the field of management and her mentoring of faculty and doctoral students. ogilvie is a former dean and founder of the Center for Urban Entrepreneurship at Saunders College. She has been published in top journals and five of her research papers have been recognized with research awards. She serves on The PhD Project Dean’s Advisory Board, was recognized with the Spirit Award by the Management Doctoral Student Association and has been inducted into The PhD Project Hall of Fame. She is honorary professor of Beijing Information Science and Technology University, served on the International Advisory Committee at Beijing Jiao Tong University’s School of Economics and Management and was named a foreign expert by the State Administration of Foreign Experts Affairs of China. She also serves on the School of Business Advisory Committee at Hong Kong Baptist University. “All of us at Saunders College of Business congratulate dt on this tremendous honor,” said Jacqueline Mozrall, Saunders College dean. 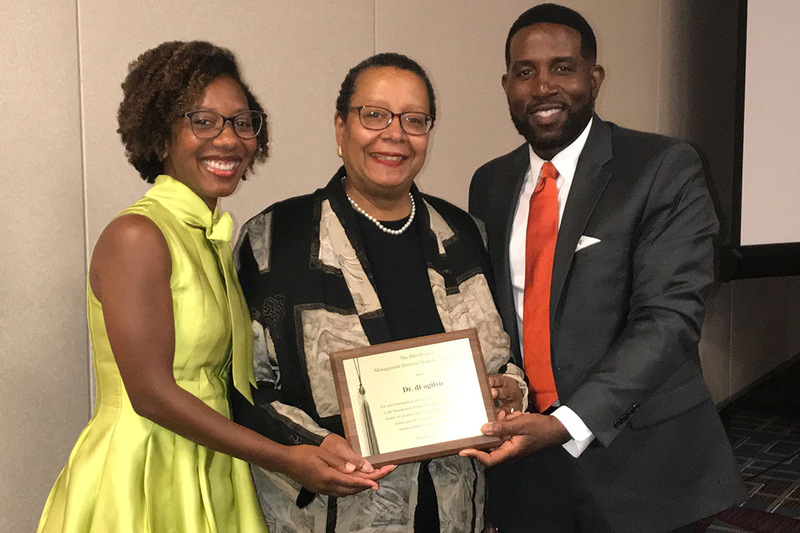 “The PhD Trailblazer Award bestowed on dt ogilvie is testimony of her sustained commitment to scholarship and to mentoring faculty and doctoral students,” said Keith Jenkins, vice president and associate provost of RIT’s Division of Diversity and Inclusion. Bernard Milano, president of The PhD Project and the KPMG Foundation, congratulated ogilvie on her achievement. “She [ogilvie] has demonstrated dedication, hard work and intelligence and continues to influence the next generation of business leaders,” said Milano. The PhD Project, founded by the KPMG Foundation in 1994, recruits minority professionals from business into doctoral programs in all business disciplines. Since its inception, The PhD Project has been responsible for the increase in the number of minority business professors from 294 to 1,470.